Through games of September 23. That May 1 win was just one of eight the Diamondbacks notched that month en route to an 8-19 record. They rebounded to go 19-9 in June, but spent the next two months meandering around .500, going 13-13 in July and 14-12 in August. Even so, they were in either first or second place in the NL West for all but one day of that two-month span of mediocrity. 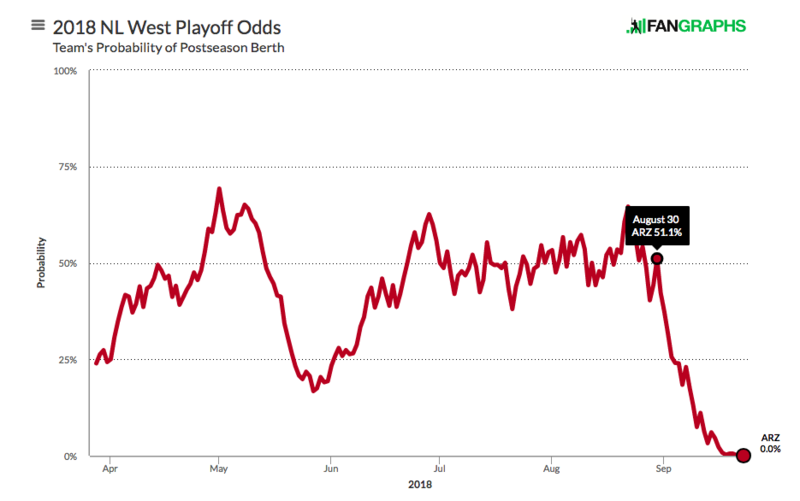 Interestingly enough, on August 28, colleague Craig Edwards foreshadowed the Diamondbacks’ September woes, noting that they possessed the hardest schedule of any team over the remainder of the season, opponents with a combined projected winning percentage of .535. Aside from five games against the lowly Padres (51-83 at that juncture) and a pair remaining against the still-mediocre Giants (67-67), they had series against the division-leading Astros (81-51), Braves (74-57), and Cubs (78-53) — as well as two series apiece against both the Dodgers (71-61) and Rockies (72-60). Even when you mentally cross off the Diamondbacks’ unplayed games (three against the Padres and two against the Dodgers, who came from behind to beat them on Monday night), that’s a daunting gauntlet to run. In a scrum of eight contenders fighting for five spots, it had the potential to be decisive. Whereas, at that point, Arizona’s raw projection to finish with 88.9 wins placed them second in the NL and an eyelash ahead of the Dodgers (88.7) in the division, Craig illustrated that factoring in the schedule lowered their projection to 87.9 wins, enough to drop them to sixth in the league, with an October free of playoff games. As you already know, it didn’t go well from almost precisely that point. Not only have they failed to win back-to-back games at any point since August 29-30, they’ve racked up two separate four-game losing streaks and two three-gamers along the way. So, what happened? In part, their bullpen turned into an arson unit. Mostly, though, the D-backs stopped hitting. Mind you, they weren’t exactly a juggernaut in the first place, batting .239/.315/.403 through August 30, numbers that ranked 26th, 20th, and 21st, respectively, among MLB teams. It’s fair to suggest that the impact of the Chase Field humidor — which, in its first season, has turned the team’s home from a very hitter-friendly one, featuring the hardest-hit balls in the majors, into one that is much closer to neutral (see Jeff Sullivan’s deep dive) — leads to underrating them in a park-neutral context; as it was, their 87 wRC+ for the period ranked 24th. On the other hand, it’s not the humidor that caused them to hit .210/.278/.360 (64 wRC+) over their next 22 games, numbers that rank 30th, 29th, 28th, and 29th, respectively. With a lineup featuring Patrick Kivlehan, Chris Owings, Ildemaro Vargas, and Christian Walker instead of the aforementioned quartet, the gambit worked for a night, as Owings, Walker, and Mathis (!) all homered en route to a 9-0 victory; it was Mathis’s first round-tripper of 2018. Alas, those nine runs matched the team’s total scored in the six games on either side of that outburst, making for a pretty weak final stand. Overall, their production dropped from 4.43 runs per game through August 30 to 3.41 after. On the other side of the ball, Arizona went from yielding 3.78 runs per game to 5.18, which is no good if you’re trying to compete for something other than the top pick in the draft. Through games of September 23. Number in parentheses is rank among all 30 teams. The starters took a hit, sure, but the bullpen’s ERA nearly doubled. I’d suggest that the toxicity of the fumes from the team’s vaunted bullpen cart finally got to them, but we all know that thing is powered electrically. Note that the bullpen was dramatically outperforming its peripherals over the first five months of the season, but that it was undone by a BABIP that spiked from .266 to .358 while the unit’s walk and homer rates both edged up slightly. Individually, we’re talking about tiny samples of fewer than 10 innings across the board, so it’s important not to get too wrapped up in any individual performance, but it bears noting that of the team’s seven relievers with a leverage index of at least 1.0 for the period, four of them — namely closer Brad Boxberger (14.54 ERA), setup men Archie Bradley and Andrew Chafin (both 9.00 ERAs) and righty Jake Diekman (15.19 ERA) — were lit up like pinball machine, even if their varying FIPs suggest the outcomes weren’t entirely within their hands. Among the starters, Zack Greinke (4.64 ERA, 4.61 FIP) and Zack Godley (7.64 ERA, 5.65 FIP) have been the least effective since August 31, though losing Clay Buchholz (2.01 ERA, 3.46 FIP) to a bout of elbow stiffness didn’t help matters. That’s a 38-point spike in wOBA against a one-point drop in xwOBA, which implies a fair bit of regression on the defensive side after the point where Sullivan highlighted the team’s strong but largely unheralded defense. Anyway, one year after winning 93 games and taking the Wild Card route into the Division Series — the team’s only time above 81 wins and only trip to the playoffs since 2011 — the Diamondbacks are on the outside looking in again. There’s talk of dismantling the squad. The Diamondbacks, rightly or wrongly, complain about payroll with some frequency, and the impact of Greinke’s contract, which has three years and $104.5 million remaining on it, is considerable, for sure. Pollock and Patrick Corbin will be free agents this winter, and Goldschmidt after 2019. The minor-league system was recently ranked 27th by Baseball America. To these eyes, there’s still a lot of talent here, enough to contend if they can figure out how to upgrade beyond a few glove men who can’t hit, but that’s not to say that it wouldn’t be a challenge. For the better part of five months, the Diamondbacks were up to that challenge this year, but for a little over three weeks, they weren’t, and it spelled their end. That’s baseball. We hoped you liked reading How the D-backs’ Season Fell Apart by Jay Jaffe! Arizona never recovered from those 3 gut shots they took in Los Angeles August 31-September 2. Entering that they were up 2 on the Dodgers with 28 games to go. They’ve gone 5-18 in these last 23 games, with a crazy 7 losses in 1 run games. also for Goldschmidt for September not hurting himself- he’s only got a 124 wRC+ in September, that’s #24 in NL. he maybe didn’t lose it himself, but he sure didn’t go out and win it either. Yes, that was tough, since they led late (I think 7th inning or later) in EVERY ONE of those 4 games, yet lost 3 of them. It was that combo of lack of hitting and not-so-great bullpen that was their undoing. But the signs were there even before that series. They lost 2-of-3 from a very mediocre Giants team right before the Dodger series, and before that they lost 2 of 3 to a reeling Mariners team, at home. yep. If I have to track down one game it was the one on August 31. Greinke goes thru 7 innings- having given up a HR to Kiki Hernandez in the 7th to tie it up 2-2. Greinke due up 3rd that inning and spot comes up with 1 on and 1 out. They have him sacrifice Marte to 2nd and then they don’t score. They have Greinke come out to pitch in the 8th- and 1st pitch of the 8th, Justin Turner hits homer to give Dodgers the lead they never relinquish.